Good morning to all of my friends at CSC! I decided to write a short post about the fit challenges that have happened to me as I age. As my body has matured, I have encountered new fit challenges that have made my clothes fit differently. Over the years, I learned to fit patterns well, but then It happened: I got older, and new problems started to appear. Not all of my fit challenges are related to aging. I reached my full height of 5’8″ at age 12–taller than any of the boys in grade 8 and taller than most of my teachers. I was BIG. I was not overweight, but nobody else looked like me, and I felt like I was some sort of freak. I don’t remember being teased or singled out by others for my size, but I remember feeling invisible. It has taken me many years to change my feelings about my body. Now I feel grateful that it has lasted so well and remained quite strong at age 63. As my fit issues started appearing, I initially called them figure flaws. I have changed my mind about that; flaws imply there is something wrong with me. There is nothing wrong with my body, and it is aging as it was intended to age. Last year at Puyallup I attended a workshop give by Lorraine Henry on how to alter for variations in figure and I had a breakthrough lightbulb moment! I was so excited about what she was talking about that I went right out and bought the book she recommended: Fitting & Pattern Alteration by Elizabeth Liechty, Judith Rasband, Della Pottberg, Steineckert. What a great textbook! It has changed my life and the way my clothes fit! In the next part of this post, I list my figure variations and then give ways to detect if you also have any of these variations. Many of these things start to happen slowly, and some of them come in clusters. Forward head: My neck is no longer upright. It now comes off my spine at a forward angle. What do you notice in your clothes? A crew neckline is too high and it often feels like I am being choked. My shoulder seams pull forward and my upper back is too tight and pull lines appear across the shoulders. Stooping, forward shoulders and rounded upper back: This one is pretty obvious in a mirror as you can see what my mom calls a dowager’s hump. What you notice in your clothes is that the back of a jacket or blouse pulls back and you notice wrinkles between the neck and the shoulder in the back. This is especially noticeable in woven fabrics. There is not enough fabric to go over the rounded back and shoulders. The back also broadens. Shoulder is rotated forward: You notice that there is too much fabric across your upper chest. You see a hollow across your upper chest when you wear certain clothes. For me, it is most noticeable in a fitted jacket. The front of sleeves are too tight and you feel like your front is much smaller than your back. I was altering my shirts before this class as if I had narrow shoulders. I have changed that now that I know differently. I also notice this in the armscye. In most patterns and RTW, the armcye does not follow my body. If the armscye is too large, the front of the sleeves don’t fit well. 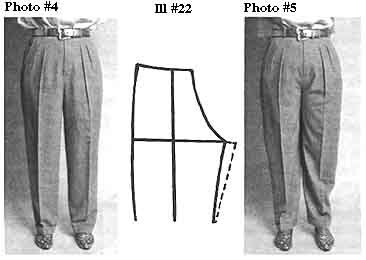 Tilted pelvis and a recessed pelvic bone: RTW pants and patterns generally have too much fabric in the front. You are able to grab a lot of fabric at the crotch on a pair of pants. Large inner thighs and a layer of chub on the inside of my knee: I don’t think this is related to aging but the pant alteration that I need to fix this in pants goes together with my alterations. What you notice is a pulling and wrinkles that show up at the back crotch pointing directly at your back crotch and often right at the knee. Above I have talked about my changing body, what you notice in how your clothing is fitting, and why things don’t fit. Now I will tell you how I fix a pattern to make things fit well for me. I have cherry picked what works for me from various sources. A number of instructors offer various ways to seek fitting help. 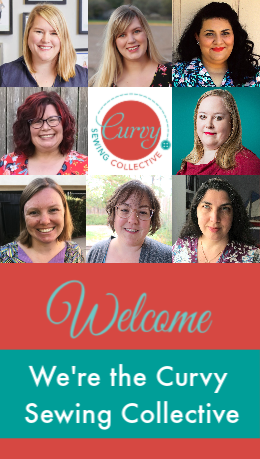 Jennifer Stern, Loes Hinse, Louise Cutting, Lorraine Henry, and Judith Rashband all offer classes, videos, or tutorials on pattern alterations. 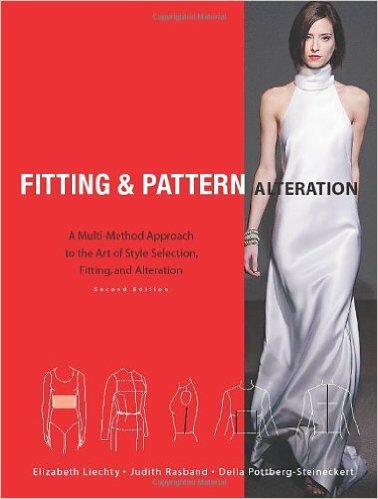 I also choose to study my Fitting & Pattern Alterations textbook and pick what works for me. Forward head: I don’t wear many crew necks, and high-necked patterns need to have a scoop done at the front neckline. This is especially noticeable in a boat neck and in a woven high-necked shirt or dress. I much prefer V-necked or scooped neck patterns and t-shirts because they need fewer alterations. I tend to like to make blouses with buttons that I can leave undone. Stooping, forward shoulders and rounded upper back (Dowagers hump): I generally do a broad back adjustment. I usually add 3/8-1/2″ addition at the mid point of the shoulder seam. 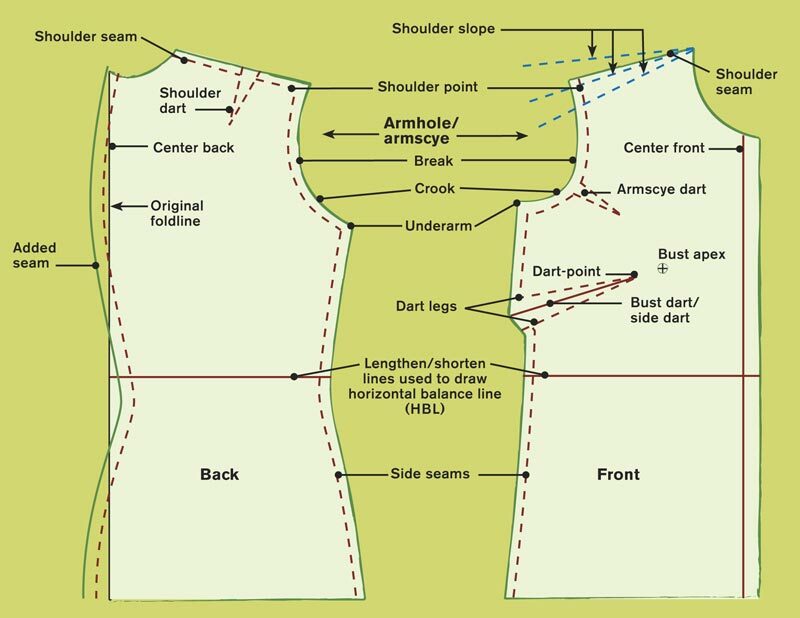 On the pattern back, I draw a straight line on my pattern from mid shoulder straight down to the hemline parallel to the grain line and cut and spread the pattern. I then add a dart of the same amount to the shoulder so that the front shoulder seam will match. The dart makes a nice curve to the back of the jacket. I also add a center back seam so I can add about a 3/4 inch extra fabric where it is needed at the upper mid back. Then I cut the seam allowance off and spread like Lorraine Henry suggested. 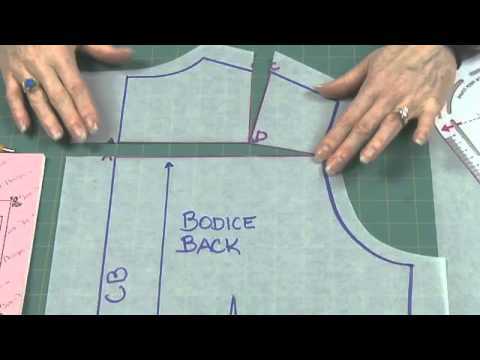 Forward shoulder: The front pattern alteration that I do is one that I was shown how to do at a Loes Hinse workshop. Starting just below the shoulder point on the front of the pattern on the armcye I start a drawing a line making the front 1-2 sizes smaller ending at the underarm seam. I use my French curve to make it a nice line. Then that exact amount you took out of the front of your pattern has to be added back on to the front of the sleeve head. This makes the sleeve curve bigger at the front and gives extra room. This is often enough extra room in the sleeve for me. Look for pattern designers that do NOT have sleeves designed the same front and back. Burda and Loes Hinse are 2 that come to mind. Ottobre magazine pattern t- shirts fit very well and need very little alterations for my body. Tilted pelvis and recessed pubic bone: I have to shorten the front of the pant at the low crotchline. I draw a line horizontal from the low crotch at right angle to the grain line. I cut along the line stopping at the sewing line and create a pivot point. I then overlap the pattern fabric by at least 1 inch, sometimes 1 1/2 inch depending on the pattern brand. I also make the front seam much more shallow a curve. My front pattern looks strange and almost has no curve at all. I then add all of the amount I took out of the front curve and add that back on the back of the pattern to allow extra room for my full and rounded bum. I have learned over time that certain pattern companies make patterns that need fewer alterations in pants. I have my best luck with the crotch curves in Burda and Stylearc. 5. Chub rub inner thighs and knee. Again this alteration was suggested to me by Lorraine Henry. I add 1/2 inch to the inseam of both the front and back of my pattern from the top to the bottom. Then starting at the same spot on the outer seam across from the crotchpoint I gently take out the same 1/2 inch all the way to the hemline. 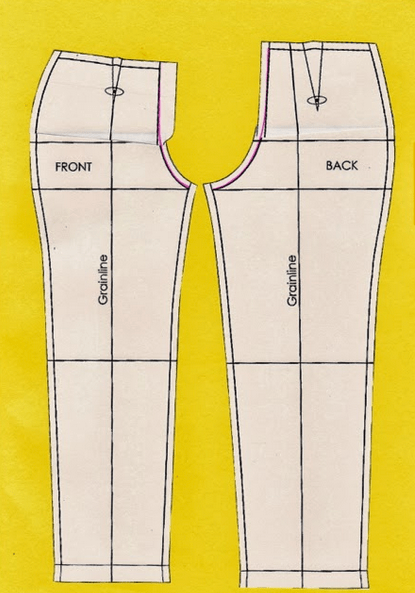 I generally do not do the second alteration on the pattern itself but after the pants are at the try-on stage. That gives me a bit of extra fabric where I might need it to finesse the fit. But I always go back and take out the 1/2 inch at the hem line even if I don’t take it all out to the hip line. This was so informative I really found it so interesting I was starting to think that I was imagining the slight changes in my maturing body. Thank you so much for the explicit information. I am 65 and never had a any idea how to make the adjustments. Thank you thank you! Thank you so much for your detailed explanations and record of your thought processes. I think I have found a new group most appropriate for my age, “new improved larger size” 65 year old body, and desire to improve my sewing skills to get the clothes and fit I want. Thank you all! There have been so many changes – mostly improvements! – since the days of Home Ec class. I love seeing fashions on mature figures to better evaluate the potential for my own projects! Bless you all! Oh, thank you! Coming up this spring there is a DVD going to be released done by Louise Cutting, on this very topic. I hope to get it when it is released as she is an excellent teacher. It should be on Treads website as well as on CuttingLine designs website! Watch for it. You are an Angel in my book. At 68 and a veteran of the Battle of the Bulge and an aging body, I want to dress appropriately for my body and sense of style. Altering RTW isn’t always possible even if one can afford it. Thank you for sharing so many techniques and resources with great pictures about so many of my fitting challenges. It’s a great article and worthy of Threads! Hey, this is a great post, lots of great info. Could you go back and put photo credits on the pix? I’d love to see more on this topic! I had most of them on my Pinterest board. I will go back and see what I can do! Louise Cutting is currently doing a DVD on this topic. I intend to buy it when it comes out. She is so giving of her time and is so very good at teaching. I think it will be well worth it! I SO appreciate your post about fitting an aging body. 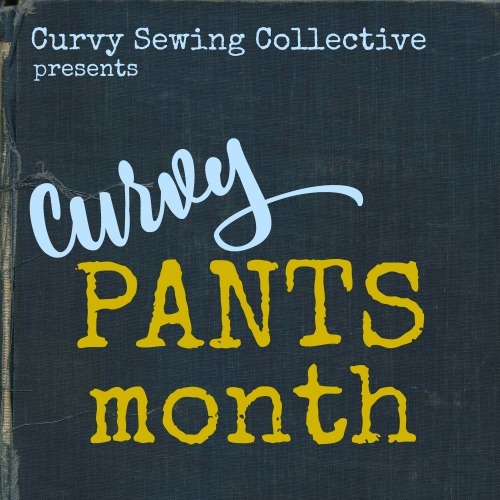 It’s hard to find anything about sewing written for “women of a certain age.” My fitting issue may be slightly different, but it is so nice that we “of a certain age” haven’t been completely forgotten in the sewing blogosphere. Wow! Such an informative post! Thank you! I’m in my late 30s but due to health issues and a significant rapid weight gain, my entire body has changed. Fitting for it is a nightmare. I can completely relate to your post! I’ll come back to your post as a fitting reference. That was helpful! Thanks for the information. I find fitting since my weight gain and as I age (what happened to my waist? it went with the estrogen!) things are not as they used to be. But I am learning and I want to thank you for the help. This was a pleasure to read! I’m 33, so, um, a little young to blame age for my fitting adjustments, but there are definitely a few fitting adjustments I should be doing anyway. I’m always happy to see how different people makes things fit! Thank you so much for this wonderful post. I am 5’8″, 63 and a little heavier than you appear to be but having all the same fitting issues. Your post helps me a great deal in sorting out fitting issues! This was a fantastic post, thank you! I’m having some of those changes, including extra ones related to sitting in front of a computer for 8+ hours a day, and I haven’t really given a thought to these adjustments as I’m still trying to figure out how to do general adjustments for my body type in the first place! I love understanding that I’ll need to understand the bio mechanic changes over time. I have many of the same fitting issues. I didn’t sew when I was young so didn’t realise which were to do with age and which to do with height etc. (5’10” by 12 – same story as you…61 now) I’m beginning to get there. I have this book. Thank you for sharing. I wish we would have gone to the same school. It would have been great to know I was not the only tall girl in the world! Great article! Body changes do happen as you age! I’m 64 and my arthritis has me always looking at closures in garments. Small buttons just don’t work anymore. And even some zippers are difficult. Velcro is your friend! As far as doctor shaming which goes along with general ignorance of anything to do with non-prescription solutions: Switch doctors. I now have a team of docs who embrace alternative medicine and treat me with respect. Great post. The most difficult job in sewing is fitting ourselves and adapting our fit issues as we age. 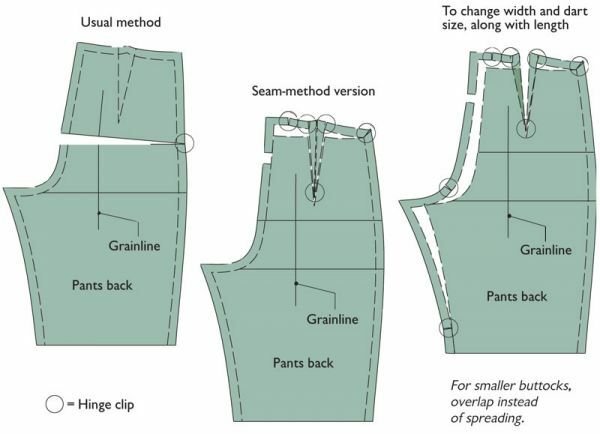 All great alterations that (ahem) mature sewists need to know. As one in her fabulous fifties swiftly approaching her seasoned sixties, I nodded my head to most of these sewing challenges. Thanks for posting this. I too identified with you! I am turning 61 next month and I’m 5’8″ with such similar fit issues to yours it was just uncanny 🙂 Thank you so much for sharing your challenge and solutions in this post. I too will investigate the book you recommend. Right on the money! I could have written this. You hit all the high points. I had to laugh when I saw the shoulder dart though. I haven’t seen one of those on a pattern in years. Makes so much difference in fit. The only thing I see missing is the fact that the bust volume also changes and may need tweeking. I don’t actually think my volume has changed much. So I didn’t think of it. Gosh – you just named so many of my figure issues! I have been trying to dig myself out of a major depression brought on by a visit to the doctor (lets just say shaming is alive and well in the medical circles). 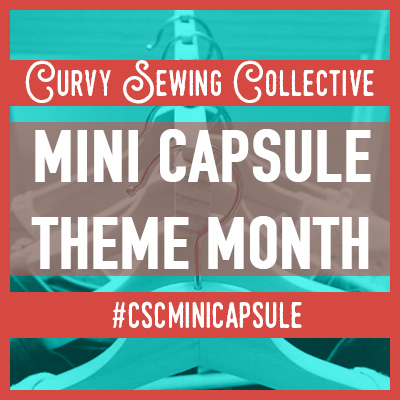 So, I sit in my sewing room, with a much needed vacation 2 weeks away – and I can bring myself to sew something to take on vacation – because nothing fits, nothing works, nothing,nothing,nothing. So, I am going to try to find this book and see if I can’t make my clothes fit better. Thanks for the post – it helped me more than you will know. Mary, I am so sorry that your doctor tried to shame you. Mine does it too. I always give it right back to him! Do they not understand that that is NOT helpful! I hope that you find a pattern or two to make up before your holiday! There are lots and lots of on line resources too. Just google your adjustment and see what comes up. Mary, I’m so sorry you had a bad experience with your doctor. Do you have the option of choosing a DO instead of an MD? That might be much more satisfying for you. Thanks! It’s always so helpful to see the alteration to the pattern. I might need to investigate the chub rub on the inner thigh alteration a little more closely….